I just tried to watch Jimmy Kimmel’s monologue on the Las Vegas massacre. After a few seconds I had to stop. With me he’s preaching to the choir. It’s too painful to be reminded we let this to happen. We choose not to stop it. How can anyone hear the audio from the shooting and not wonder why this level of death machine is allowable? I just don’t get it. I have friends who are sportsmen. I don’t want to restrict their fun, but I do ask they allow themselves to be inconvenienced for the common good. This is the time to talk about gun control. Right now while we’re angry. Right now while we’re grieving. Right now while we can close our eyes and hear that sound. these weapons of destruction and devastation. I couldn’t agree more with your comments. Lowering the Flag and having a moment of silence are not enough. Congress needs to pass sensible gun measures to help protect us. I’m surprised that you would even consider watching that character preaching disgusting liberal bias from his soapbox. Geoff, I always admired your meteorologist appearances on TV, but I definitely do not want to hear your, or any other “entertainer’s”, political opinions. Most of us are capable of making our own personal choices, we certainly don’t need help from liberal “entertainers”. What about the message? You say entertainers are unimportant, but that’s all you’re talking about. What about the message? I don’t read anywhere in George’s comment where he says entertainers are unimportant….and I don’t get that impression from his comment. Goodnight. Jimmy Kimmel was disgusting during his monologue last night….he’s such a liar. Lie after lie after lie spewed out of his mouth. Blaming the Republicans for the mass shooting…he is out of his mind. He’s going to have a nervous breakdown on air some night. Then he claims no one should have guns…BUT he has his own personal armed security guards… he’s such a hypocrite… I can’t even stand listening to him… and I won’t anymore. And no I’m not a Republican if you’re wondering. I don’t understand how he thinks he should be representing anybody, and using a show that’s supposed to be a comedy show, and using it instead for politics. He should be ashamed of himself. There’s nothing in his statement which says guns should be banned. I read the whole thing because I suspected you were making stuff up. Please show me one lie in his statement? There are none. Having strong opinion doesn’t allow you to change the facts. I have let you spray your stuff all over here tonight, but at the next lie it all goes. You have been warned. As you know, at least 59 people are dead, hundreds of people are wounded in what they’re saying is the deadliest mJimmie Kimmel’s sass shooting in modern American history — coming about a year and a half after the previous deadliest mass shooting in modern American history in Orlando when 49 people lost their lives. And of course we pray for the victims and for their families and friends and we wonder why, even though there’s probably no way to ever know why a human being would do something like this to other human beings who are at a concert, having fun and listening to music. Jason Aldean was on stage, Luke Combs who was here with us tonight, he played the show, too. And obviously no one could have ever expected that something terrible would happen, but it did. A very sick person smuggled 17 guns into his hotel room and smashed out the windows, started firing indiscriminately from the 32nd floor into a crowd of 22,000 people across the street. And as a result of that, this morning, we have children without parents and fathers without sons, mothers without daughters. We lost two police officers. We lost a nurse from Tennessee. A special ed teacher from a school here in Manhattan Beach. It’s the kind of thing that makes you want to throw up or give up, it’s too much to even process. All these devastated families who now have to live with this pain forever because one person with a violent and insane voice in his head managed to stockpile a collection of high-powered rifles and use them to shoot people. The guy was an accountant, he has no criminal record. His brother who lives in Florida seems totally shocked, genuinely dumbfounded, he said he saw no sign of any of this. The owner of the store that sold the killer some of the rifles said he passed the government-mandated background check when he was in the store. He wasn’t on any watchlist. He didn’t seem to have been a religious or political extremist. Came out of nowhere. Because of that, because there weren’t any of the usual signs, I’ve been reading comments from people who say, “This is terrible, but there’s nothing we can do about it.” But I disagree with that intensely. Because of course there’s something we can do about it, there’s a lot of things we can do about it. But we don’t, which is interesting. Because when someone with a beard attacks us, we tap phones, we invoke travel bans, we build walls, we take every possible precaution to make sure it doesn’t happen again. But when an American buys a gun and kills other Americans, then there’s nothing we can about that. The Second Amendment, I guess, our forefathers wanted us to have AK-47s is the argument, I assume. Orlando, Newtown, Aurora, San Bernardino, every one of these shootings the murderer used automatic or semi-automatic rifles, which are not weapons you use for self-defense. They’re weapons designed to kill large numbers of people in the shortest possible amount of time. And this guy, reportedly he had 10 of them in his room, apparently legally. At least some of them were there legally. Why is that allowed? I don’t know why our so-called leaders continue to allow this to happen. Or, better question, why do we continue to let them allow it to happen? Five people got shot in Lawrence, Kansas, last night, three of them died, it didn’t even make a blip because it’s just a regular part of our lives now. And you know what will happen, we’ll pray for Las Vegas. Some of us will get motivated, some of us won’t get motivated. The bills will be written, they’ll be watered down, they’ll fail. The NRA will smother it all with money and over time we’ll get distracted, we’ll move on to the next thing. And then it will happen again. And again. Last night, White House press secretary Sarah Sanders said this is not the time — actually it was today, this morning, she said it was not the time for political debate. I don’t know, we have 59 innocent people dead, it wasn’t their time either. So I think now is the time for political debate. President Trump is visiting Las Vegas on Wednesday, he spoke this morning, said he’s praying for those who lost their lives. In February, he also signed a bill that made it easier for people with severe mental illness to buy guns legally. Senate Majority Leader Mitch McConnell, Speaker of the House Paul Ryan, a number of other lawmakers who won’t do anything about this because the NRA has their balls in a money clip, also sent their thoughts and their prayers today, which is good. They should be praying. They should be praying for God to forgive them for letting the gun lobby run this country, because it’s so crazy. Right now, there are loopholes in the law that let people avoid background checks if they buy a gun privately from another party, if they buy a gun online or at a gun show. So I want to show you something. These are the faces of the senators who, days after the shooting in Orlando, voted against a bill that would have closed those loopholes. These are the 56 senators who didn’t want to do anything about that. Ninety percent of Democrats — I’m not talking about politicians here, I’m talking about people — and 77 percent of Republicans support background checks at gun shows. Eighty-nine percent of Democrats and Republicans are in favor of restricting gun ownership for the mentally ill. But not this gang! They voted against both of those things. So with all due respect, your thoughts and your prayers are insufficient. By the way, the House of Representatives is voting on a piece of legislation this week. It’s a bill to legalize the sale of silencers for guns, this is what they’re working on. We have a major problem with gun violence in this country, and I guess they don’t care. If I’m wrong on that, fine, do something about it. Cause I’m sick of it. I want this to be a comedy show. I hate talking about stuff like this. I just want to laugh about things every night, but that — it seems to becoming increasingly difficult lately. It feels like someone has opened a window into hell. And what I’m talking about tonight isn’t about gun control, it’s about common sense. Common sense says no good will ever come from allowing a person to have weapons that can take down 527 Americans at a concert. Common sense says you don’t let those who suffer from mental illness buy guns. In June of last year, the NRA fought to make sure people on the no-fly list can buy guns. They aren’t allowed to get on a plane; they’re allowed to own a very dangerous gun. Who thinks that makes sense?! Them, I guess, the people who voted with the NRA. Maybe I’m nuts, but I would like to think we could put politics aside and agree that no American citizen needs an M-16 or 10 of them. And maybe that way, we don’t do this again. And that seems very reasonable to me. You know, in 1980 we had a big fire at the MGM in Las Vegas. It was horrible, 85 people died, you could see the fire. I was 13 years old, I’ll never forget it. A man jumped out the window, it was a terible thing to see. Then a few months later there was another fire at the Hilton and five people died. So you know what they did? They changed the laws! They made major changes to the fire safety codes and it hasn’t happened again. Why would we approach this differently? It’s a public safety issue, and something needs to be done already. So tell your congresspeople to do something. It’s not enough to send your love and prayers. We do, we send our love and support and whatever else is needed to Las Vegas, and to the families from all over the country and Canada who had the worst night of their lives last night. Vegas is a funny town, it’s easy to forget people live there, but they do. Lots of good people. These people showed in droves today to donate blood because it’s the only thing they could do, and so they did it. But there is more that we could do, and we need to do it. 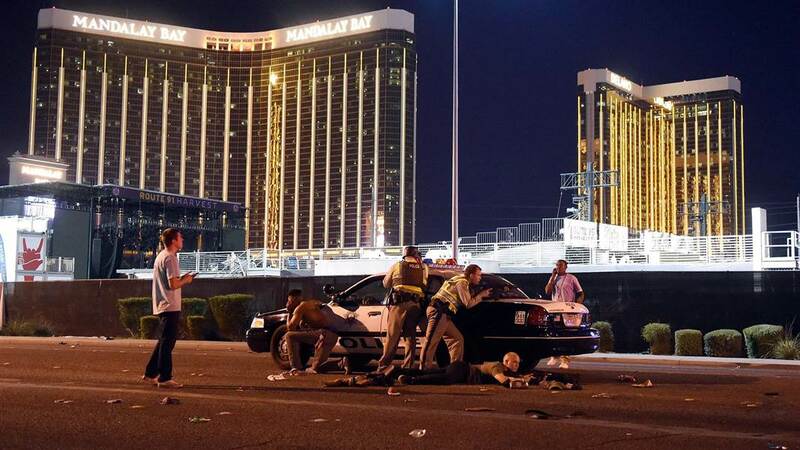 Thank God for the police in Las Vegas, who risked their lives trying to locate the man with the gun. Thank God for the doctors and nurses and firefighters and paramedics who rose to the occasion, as they always seem to do when we need them to. And for the concertgoers themselves who helped each other, who threw their bodies on top of each other, who drove their private cars full of people who were bleeding to the hospital. Don’t forget them. And don’t forget what’s going on in Puerto Rico, either. Just because they’re not the lead story today, they still need help. And if you want to help either one … a good way to do that is to give to the American Red Cross … and we send all our love to our family and friends in Las Vegas and everyone affected by this terrible event. I’m sorry for getting emotional, I’m not great with this kind of thing. But I just think it’s important, you know? After listening again….I still feel he is clearly implying he doesn’t want anyone to have semi-automatic guns (sincerely, my apologies for not previously being more exact in describing the gun)….he sees no need for why anyone should own one. Then he displays a large photo of the people who voted in a way he doesn’t agree with. Then he says President Trump signed a bill to make it easier for the severely mentally ill to purchase guns legally…that’s not true. He needs to read the entire bill. The whole thing was tainted with too much political liberal bias…in my opinion. You don’t have to agree with me as we clearly are interpreting the monologue quite differently. Did you not listen? Or did you make up in your head what he was saying? He was not blaming Republicans – in fact, he stated that the number of Republicans in favor of background checks, etc is quite high. He showed pictures of the politicians who voted against such safety measures without naming their affiliation. He never once said that no one should have guns. This happened in his hometown so it was quite personal for him. Did you complain when “comedy talk shows” were somber after 9/11? Kimmel is correct. Thoughts and prayers, lowering the flag, etc. are insufficient. That’s just talk. We need to do something about the insanity that has overtaken our world with these killing machines. I’m glad I am not a young person anymore. The future does not look bright, at least as long as we have this so-called “leadership.” Shame on middle America. Guns can’t pull their own triggers….it’s pulled by a human. More strict gun laws are not going to stop criminals from getting their hands on them….but it will keep them out of honest citizens hands so they can’t protect themselves. You should drop to your knees and thank the good Lord we have President Trump (no I’m not a Republican)….take a look at Europe and the daily mass rapes, beatings, and carnage from the invasion of all the refugees….get online and educate yourself….watch raw footage on YouTube. Europe is absolutely ruined…I know, I’ve been,there before the refugees and after the refugees arrived…I’ll never return….the most beautiful countries have turned into hellholes and are extremely dangerous now…especially for a woman. What happened yesterday in Vegas was absolutely senseless and horrific but having stricter gun laws would not have stopped it. Obama has divided America more than any other president(and that’s what we are dealing with now)and has created more debt than any other president. Antifa is a product of the liberals who supported Obama….these are facts. Antifa threw a huge celebration party after the mass shootings chanting that all the people that died we’re Republicans so it was worth it. The actual video is online…go watch it…sick sick sick people. People need to wake up and educate themselves about what is happening to our country. This country needs to get tough because the ones who aren’t going to get tough are the ones that are going to be crying when they watch their daughters and granddaughters get raped by the refugees when they infiltrate this country if it’s not stopped. Castro still has the guns! You tell me how they all turned out. I totally agree with you Geoff. My neck is sore from shaking my head at some of these other opinions. I won’t address every argument but I will say this ..NO ONE is talking about taking ALL the guns!!! Geez!!! I’m not even going to get into the above discussions. But I do wonder why, if there is a national registry, there can’t be some way of a gun store owner to be able to tap into other such shops within a surrounding states area to see if this same person has dealt with other such shops. If the same guy or woman comes back to your store 2 or 3 times to buy a different model, there should be a way to find out how many other dealers he has purchased from. I am not a gun owner—nor was anyone in my family a hunter or gun enthusiast. I used to enjoy archery, but as a sport vs hunting. I agree with you Geoff! There is no reason for people to have this kind of gun in their hands! The time to act is now. I am the mother of 7 children and grandmother of 18. My heart breaks for the families and friends of the victims. Also for the people who survived and have to live with the sights and sounds of that horrific night! I am a Christian and my husband and I will be praying for them. I have a very hard time trying to understand why all of these horrible things are happening. I don’t think anyone can understand all of what is going on with the devastating hurricanes, the earthquakes, the fires, and the shootings. As for our family, we will keep praying.